The following restaurants have such spectacular views and they are the perfect venues for special occasions like birthdays and anniversaries. If you happen to be in a city where any one of these restaurants is located, then you’re definitely lucky. Sierra Mar is perched on one of the Big Sur cliffs overlooking the Pacific Ocean. Sitting inside the scenic restaurant in Post Ranch Inn, you will be gratified by the immenseness of the ocean’s seemingly limitless sprawl as your gastronomic sense is sated by Chef John Cox’s innovative dishes that incorporate local ingredients, such as the Taste of Big Sur which features fresh seafood served in bite-size pieces. The River Café is located under the Brooklyn Bridge and it provides an expansive view of the awesome New York skyline as well as the Statue of Liberty. Since 1977, this elegant restaurant has been the favorite destinations for New Yorkers and tourists alike. The Chefs of River Café have developed its own line of Modern Cuisine at its highest level with the marriage of classic and innovative cooking techniques with American and international styles. Dine while enjoying their extraordinary wine list, romantic piano music nightly and breathtaking floral arrangements, the River Café is a magical experience. The Elements Restaurant at the Sanctuary Resort Scottsdale, Ariz. provides a really nice view of Paradise Valley while you indulge in the innovative seasonal menus of Chef Beau MacMillan. He incorporated the local, organic produce, sustainable seafood, and hormone-free meat. While enjoying the view, you savor its delicious, diverse fare that includes premium in-house smoked meats, a raw bar for shellfish and sashimi, as well as vegetarian and gluten-free options. A short plane ride can take you to Sunset Da Mona Lisa the best Seafood and Italian Restaurant in Cabo, San Lucas, Baja California Sur, and Mexico. Located at the top of Cabo Bay, you will dine amidst its magical atmosphere of breathtaking views of the ocean and the arch. Chef Paolo Della Corte created his masterpieces of fresh seafood and homemade pasta that makes your trip worthwhile and endearing. Whether you are dining on the cliff’s terrace or toasting at sunset hour or attending a special event, you will have a unique and memorable experience. Dasheene in St Lucia, in the West Indies, is one of the most popular restaurants in the cliff-side at Ladera in the Caribbean. You have a front-seat view of the majestic sunset overlooking the Caribbean Sea and dramatic Piton Mountain 1,100 feet above the Anse de Pitons inlet that takes your breath away. Executive Chef Orlando Satchell and Head Chef Nigel Mitchell oversee the restaurant. Using only the freshest ingredients, they are known throughout the Caribbean for their innovative kitchen masterpieces and imaginative handling of West Indian cuisine. Ingredients are all fresh as they are grown by island farmers on nearby plantations while fish is caught daily in the nearby waters. In the luxury boutique hotel of 6.8 Casa Palopó, you will catch magnificent sunsets and stunning volcanoes. As the sun sets, you can rely on their fully stocked bar surrounded by hanging iron candelabras and a collection of candles. The restaurant is bathed in soft light and ready for any romantic interlude. Your sensual pleasure is satisfied by a menu of mouthwatering dishes, and the wide choice of assorted treats. Adjacent to the ancient citadel of Machu Picchu, the Sanctuary Lodge, in Cuzco Peru is the best hotel to explore the beautiful surrounding area. Machu Picchu is a sacred and magical place of spectacular sunrises and mystical moonlit nights and one of the world’s major heritage sites. At the same time, you enjoy a simply composed Peruvian cuisine smack with delightful little exotic touches. Belmond Sanctuary Lodge is the perfect place to relax and unwind in the shadow of the Lost City. Paris is the end-all of dining on top of the world. Make Jules Verne your perfect setting for a rare experience and a step outside of time and space. Expect plenty of delightful surprises as you are guided to explore an exceptional 5 or 6-course meal journey. You will have a sommelier as a companion who will guide you through perfect food-wine pairing. Savor the 5-course contemporary French cuisine while gazing at the most spectacular view of the City of Lights, shimmering beneath your feet. To fully enjoy the experience, the chef has also created a unique “tasting” menu for their diners. The most exhilarating thrill of seeing spectacular views of the world while savoring a truly exquisite menu is more than enough to satisfy even the most discriminating taste. 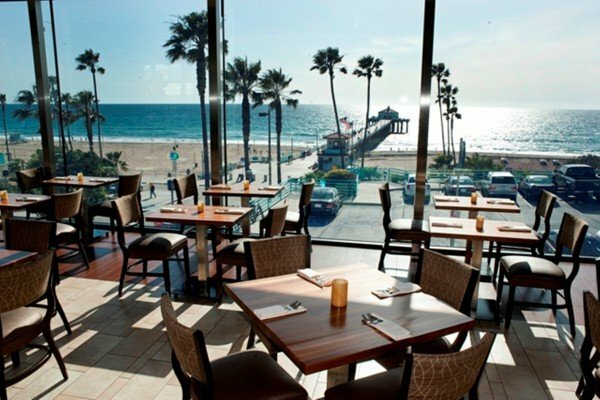 And remember, if you are close to Bahama Breeze or Joe’s Crab Shack be sure to give them a try because they are also known to have amazing views and delicious food.